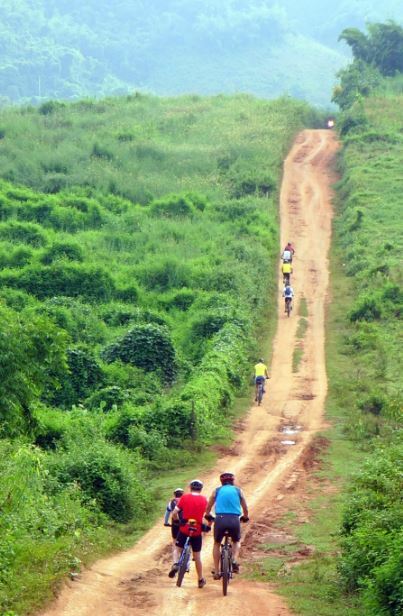 Avoid the tourist circuit and let your bicycle take you on this remote route through northern Vietnam and Laos. (TRAVPR.COM) THAILAND - April 8th, 2015 - SpiceRoads has launched a new 14-day tour – Remote Vietnam and Laos by Bike – from bustling Hanoi to the UNESCO World Heritage site of Luang Prabang. This off-the-beaten-track tour leads cyclists through traditional local communities nestled in stunning landscapes and explores fascinating historical sites. The tour has been designed for people who want to get away from the main tourist thoroughfare, stay in authentic guest houses, and eat local. The first day starts with a short transfer out of the frenetic city of Hanoi and into the peaceful countryside. The tour includes a visit to local artisans in Bat Trang, a leisurely cruise through three natural caves, and a visit to the ancient capital of the Dinh and Ly dynasties. After a night in Cuc Phuong National Park, the tour heads to the beautiful Mai Chau valley before cycling across the border into Laos at Na Meo. In Laos, there is a visit to the Vieng Xai caves, a nighttime wildlife safari along the Nam Nern River, and a trip to the prehistoric Plain of Jars. The tour ends in the enchanting Luang Prabang. The tour cycles on paved roads, alongside rivers, through lush paddy fields, into karst landscapes and peaceful villages before taking on some climbs to truly appreciate the views of the surrounding natural splendors. On days when the climbs are tough, distances cycled are shortened; rides vary between 30 and 70 km per day with the option of cycling 100 km for one day. The journey takes a route less frequented, and therefore some overnight stays at guesthouses will be basic (but clean), with shared facilities. The tour cost is US$2,950 with an additional US$180 for bike rental. The single supplement is US$325. The tour cost is inclusive of accommodation, the majority of meals, support vehicle, and drinks and snacks while riding. Bookings for 2015 tours (Sep, Oct, Dec) will include free bike rental.